Sample preparation prior to chromatographic separation plays an important role in the analytical process. To avoid time-consuming and manual handling sample-prep, automated on-line techniques such as on-line SPE-HPLC are therefore preferred. 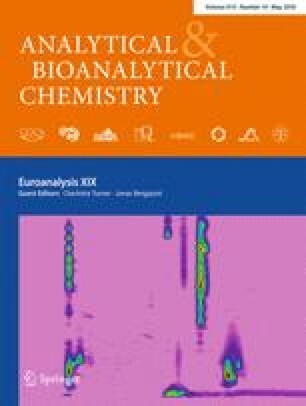 In this study, two different on-line extraction approaches for mycotoxin/endocrine disruptor zearalenone (ZEA) determination using either molecularly imprinted polymer (MIP) with selective cavities and binding sites for extraction or a reversed-phase sorbent C18 providing non-selective interactions have been developed, validated, and compared. The validation characteristics were compared and the two methods were evaluated as being almost equal in terms of linearity, repeatability, precision, and recovery. Recoveries were in the range of 99.0–100.1% and limits of detection were found the same for both methods (1.5 μg L−1). Method precision calculated for spiked beer samples was better for C18 sorbent (2.5 vs. 5.4% RSD). No significant differences in the selectivity of either extraction method were observed. The possible reasons and further details associated with this finding are discussed. Finally, both validated methods were applied for the determination of ZEA contamination in beer samples. Due to ZEA’s native fluorescence, chromatographic separation with fluorimetric detection (λex = 270 nm and λem, = 458 nm) was selected. Determination of zearalenone in beer using an on-line extraction chromatography system. Published in the topical collection Euroanalysis XIX with guest editors Charlotta Turner and Jonas Bergquist. The online version of this article ( https://doi.org/10.1007/s00216-018-0920-2) contains supplementary material, which is available to authorized users. This work was supported by the Charles University Grant Agency, project No 726316, and by the project GAČR, no 15-10781S. I. Lhotská gratefully acknowledge the financial support of the project of specific research of Charles University, project no SVV 260 412. This work was also supported by the STARSS project (Reg. No. CZ.02.1.01/0.0/0.0/15_003/0000465) co-funded by the ERDF. Peters J, van Dam R, van Doorn R, Katerere D, Berthiller F, Haasnoot W, et al. Mycotoxin profiling of 1000 beer samples with a special focus on craft beer. PLoS One. 2017; https://doi.org/10.1371/journal.pone.0185887.